You’ve seen them out there. Calm, confident paddlers gliding by on their floating boards without a care in the world. What a life, right? Perhaps you’ve envied their seemingly carefree approach to water sports, or the fact that they’re able to enjoy the beauty of the beach and ocean from a different perspective. Whatever brings you to try stand up paddle boarding, you’re not alone. Apparently, in 2013, SUP had the most first-time participants of any sport in the USA. If you’re new to the sport, or simply thinking about giving it a try, here are a few things to consider. 1. Know How to Choose Your SUP Board. Where are you going to get in the water? What are the conditions? Is it a smooth canal or a rough, windy bay? The type of board you choose will not only depend on the conditions you’ll be using it in, but the type of activity you intend to do as well. Do you want to surf or cruise? If you choose a crossover board, you can do both. It’s not going to be super maneuverable for surfing, but you’ll have a lot of fun cruising to flat island, Kaneohe Bay and up the East side past Kualoa Ranch, and be able to surf fun waves, too. Most people don’t come into Kimo’s Surf Hut saying they want to race. They usually start with a crossover board that lets them catch small waves (chest high or below), and they cruise for a while till they get comfortable. They often come back 6 to 9 months later saying, “I just had this awesome surf session!”. Maybe they entered one of the fundraisers where you just show up with what you have and race with friends. Now they want to upgrade to a racing or surf style board. Understanding what you want comes from the experience of getting out there, and finding where you’re experiencing the most joy. 2. Practice Your Paddle Technique. 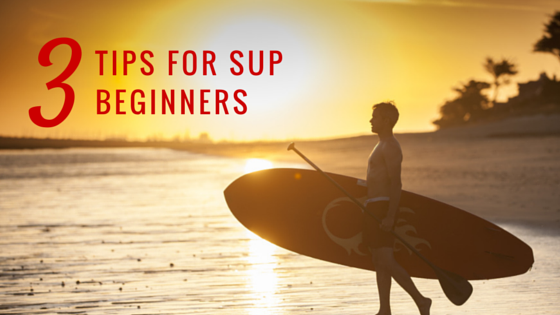 There are few prerequisites to getting the most fun out of your first SUP sessions. “The first thing I tell kids who are learning to surf is that you gotta swim first.” says Kimo. It’s the same for SUP. You don’t need to be an Olympic swimmer, but you should be able to handle yourself in the water, especially if you lose your paddle. Speaking of paddle, did you know there is a trick to keep you from tiring out too fast? Many people who are new to paddling will just pull, pull, pull, switch sides and pull, pull again. By doing this, you tire out the same muscles on both arms continuously. The technique for SUP paddling is similar to paddling a canoe. Pull with the bottom hand and push with the top for an efficient paddle stroke. That way, when you switch sides, you’re now using the opposite muscles to push and pull. 3. Pick the Right Paddle. Your paddle is extremely important. After 6 months of paddling, it’s easy to get comfortable and start venturing out a little further off shore. The last thing you want is to find out that your aluminum paddle is so corroded that it’s about to break. It’s one thing if you’re on a small lake where people can see you. It’s totally different to be in Hawaii, in the middle of the Pacific Ocean, with no paddle. Here at Kimo’s we only carry warrantied paddles by quality companies like Kialoa and Werner. They stand by their work, and have been in business a long time. There are different price points for different skill levels and interests. If you’re not sure what you need, feel free to ask us! We only sell paddles that float, which should be common sense. When your paddle falls out of your hand, are you going to want to leave your board to go diving for it? Probably not! We only sell used boards that have been checked out, and made water tight, if needed. There’s a certain amount of risk to buying used boards from a friend or stranger. They might mean well, but didn’t realize there was a problem with the board. You could end up spending more money on something that needs a lot of repairs. We’ve seen our customers come in with used surfboards and paddle boards that they’ve purchased elsewhere that needed way more work than they realized. We can do the repairs, but it’s not fun having to pay more than you expected to get into the water. Whether you’re a seasoned SUP enthusiast or brand-new to the sport, come to Kimo’s Surf Hut. We’ll make sure to match you with the right board and paddle for your needs!